Endangered species? 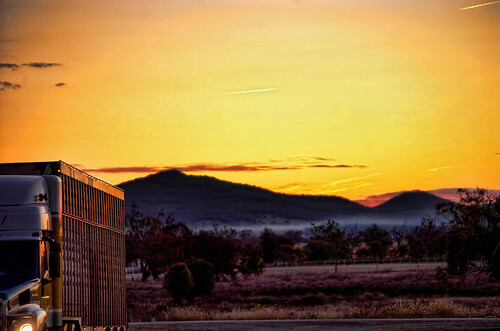 A truckstop by sunset. Photo by Indigo Skies Photography on Flickr. A selection of 8 links for you. Because I like the cut of your jib. I’m charlesarthur on Twitter. Observations and links welcome. The app maker alleged Google pulled Disconnect because the software disrupted Google’s tracking and advertising efforts, the source of most of the internet company’s revenue and profit. In an email included in the complaint, a Play store employee said the app was removed [from Google Play] because it prevented other apps from delivering ads. Disconnect asked European antitrust regulators to require Google to put its apps back in the Play store and treat the apps the same way Google treats its own privacy and security software. A Google spokesman called Disconnect’s claims “baseless.” Google has allowed more than 200 other privacy apps in the Play store, but blocks any apps that alter other apps’ functionality or remove their way of making money, he added, saying Google applies this policy uniformly, with strong support from Android developers. Tricky, this: Disconnect says that the key point is that Google doesn’t hold itself to that standard on privacy and security, and that it doesn’t prevent ad-serving – just tracking. Google says that it makes the store, so it decides the rules. 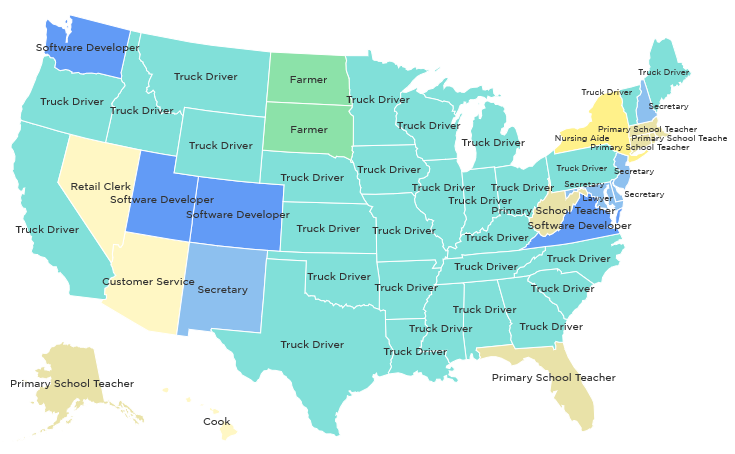 This is a map of the most common job in each US state in 2014. It should be clear at a glance just how dependent the American economy is on truck drivers. According to the American Trucker Association, there are 3.5 million professional truck drivers in the US, and an additional 5.2 million people employed within the truck-driving industry who don’t drive the trucks. That’s 8.7 million trucking-related jobs. …Truck driving is just about the last job in the country to provide a solid middle class salary without requiring a post-secondary degree. You can argue about the exact numbers, but the point that it’s not just the driving that’s affected is important. See also the next link about sewing. it is devilishly difficult to make a machine in which fabric goes in one end and finished garments, such as jeans and T-shirts, come out the other. The particularly tricky bit is stitching two pieces of material together. This involves aligning the material correctly to the sewing head, feeding it through and constantly adjusting the fabric to prevent it slipping and buckling, while all the time keeping the stitches neat and the thread at the right tension. Nimble fingers invariably prove better at this than cogs, wheels and servo motors. “The distortion of the fabric is no longer an issue. That’s what prevented automatic sewing in the past,” says Steve Dickerson, the founder of SoftWear Automation, a textile-equipment manufacturer based in Atlanta, where Dr Dickerson was a professor at the Georgia Institute of Technology. The company is developing machines which tackle the problems of automated sewing in a number of ways. They use cameras linked to a computer to track the stitching. I’m moderating a session later this week looking at the questions around this topic: when automation and machine vision and capital come together to take these jobs away, what do the people who would have done them do instead? Although USB-C seems an inevitable success at this point, it does have a couple of issues to iron out, perhaps the most pressing of which is the complexity of its offering. There will be USB 2.0 devices with USB-C connectors, like the Nokia N1; USB 3.1 devices that use regular USB-A connectors; USB 3.1 “Gen 1” devices only capable of 5Gbps transfer speeds over USB-C, like the new Chromebook Pixel and MacBook; and USB 3.1 Gen 2 devices that give you 10Gbps. USB-C could be the only cable you ever need, but at this point it may be hard to know exactly what performance you’re going to get when you plug something in. “I think there’s the potential for confusion,” says [president and COO of the USB Implementers Forum, Jeff] Ravencraft, whose forum publishes language and usage guidelines for both USB 3.1 and USB-C.
“You do not get performance with the cable, you do not get power delivery with just the cable. The cable is a conduit for those things, right? So to have power delivery, the device has to have a power delivery controller, the host or the hub has to have a power delivery controller, and then you have to have the right cable.” The USB Implementers Forum offers training programs to help employees at retailers like Best Buy and Staples give accurate information to consumers, and is particularly aiming to crack down on “bad-actor” manufacturers that try to deliberately mislead. – The MH17 flight path was not altered in the way claimed by the Russian Ministry of Defence. Data from the Dutch Safety Board’s preliminary report and other sources show Flight MH17 made no major course changes such as the one described in the Russian Ministry of Defence press conference. Weird that Russia is claiming to have had no involvement in MH17 and yet still takes the trouble to do this. But when you have a country whose leaders are paranoid.. well, read the next link. [Ludmila] Savchuk’s revelations about the agency have fascinated Russia not because they are shocking but because they confirm what everyone has long suspected: The Russian Internet is awash in trolls. “This troll business becomes more popular year by year,” says Platon Mamatov, who says that he ran his own troll farm in the Ural Mountains from 2008 to 2013. That, though, is only the amuse-bouche. Then Chen finds himself dragged down the rabbit hole. Today’s must-read. Liu Jun, one of four executive vice presidents under CEO Yang Yuanqing and a company veteran of 22 years, will be replaced by Chen Xudong, the head of ShenQi, a sub-division that sells mobile devices, the company said in a statement. Chen, 47, takes the reins of the division at a critical time. He must integrate the Motorola unit acquired from Google Inc for $2.9bn six months ago, while trying to counter a damaging slump in phone shipments. Lenovo, the fifth largest player in the Chinese market, shipped 22% fewer phones in the first quarter compared to the same period a year earlier, according to research firm IDC. In stark contrast, Apple’s first-quarter China shipments jumped 62%, while Xiaomi and Huawei had gains of 42% and 40% respectively. Lenovo did not offer a reason for Liu leaving the post but said he would continue for an unspecified period as a special consultant to Yang. Lenovo has a tough challenge with the tightening China market and Motorola’s integration. in analyzing the structure of each employee’s Twitter network, we found that there was a positive relationship between the amount of diversity in one’s Twitter network and the quality of ideas submitted. However, Twitter activity and size measures (such as the number of tweets, number of followers and number of people followed) were not correlated with personal innovation. We can explain these findings further by examining the Twitter sociograms of two EMC employees. In the diagrams, circles represent Twitter users, and an arrow from one user to another user indicates that the first user is following the second user on Twitter. Even though both employees A and B follow approximately the same number of Twitter accounts, A’s network is far more diverse than B’s. That is to say, the people whom employee A follows on Twitter are, for the most part, not following each other. We can determine this level of diversity mathematically by using the compactness ratio, which measures the degree to which people in the network are connected to each other. For employee A, the network’s compactness ratio is quite low, at 18%. Our research found that loose Twitter networks, such as employee A’s, are better for ideation, because the potential for accessing a divergent set of ideas is greater. Is it sort of “be less like Facebook”? This entry was posted in links and tagged antitrust, employment, google, russia, selfdriving by charlesarthur. Bookmark the permalink. Re: automated trucks -> it depends on whether you are going for Automation 3 (“supervisor” behind the wheel) or Automation 4 (full automation, perhaps no steering wheel at all). Daimler is going for 3 with its truck, making the driver more act like pilot (bringing it to the Highway, watching the auto-pilot with one eye, taking it through the city to destination). 3 can be expanded to other roads of course, and 4 is a possibility, but a bit trickier if you want to bring a product to market soon (= the next 5-10 years). I am not sure it is a zero-sum-game where we will see only (3) or only (4), especially as there is a huge job factor behind it that even the market-friendly U.S. can’t ignore (and you can’t outsource trucking to other countries). It will be interesting to see how regulation and standards will evolve around the world, because these systems should work globally without large modifications. And from this perspective, a common standard of (3) seems more likely, at first at least (which seems to be what most automotive companies push for, as they simply need to weave together and slightly expand the sensors they already have built in).